Bangladeshi security forces this morning ended the 12-hour long siege at the Holey Artisan Bakery in the high-security Gulshan diplomatic zone, killing six terrorists and capturing one alive. Dhaka: Armed militants killed 20 civilians after taking them hostage in a Bangladesh cafe overnight and many of the victims were hacked to death, an Army spokesman said on Saturday. Thirteen survivors were also rescued at the end of the siege in an upmarket neighbourhood of the capital Dhaka, including three foreigners. Officials had earlier said that six gunmen were killed. Indian Prime Minister Narendra Modi telephones his Bangladeshi counterpart Sheikh Hasina and condemns the despicable attack in Dhaka. The attack in Dhaka has pained us beyond words. I spoke to PM Sheikh Hasina & strongly condemned the despicable attack. India stands firmly with our sisters & brothers of Bangladesh in this hour of grief. My thoughts are with the bereaved families. I pray that those who are injured recover quickly. The Indian girl who died in Dhaka was 19 years old. India's Minister for External Affairs Sushma Swaraj confirms the death of an Indian girl in Dhaka. Thirteen survivors were also rescued at the end of the siege in an upmarket neighbourhood of the capital Dhaka, including three foreigners. "Three of those who were rescued were foreigners, including one Japanese and two Sri Lankans," says Brigadier General Nayeem Ashfaq Chowdhury. "We`ve recovered 20 bodies. Most them had been brutally hacked to death with sharp weapons," Brigadier General Nayeem Ashfaq Chowdhury tells reporters in Dhaka, without giving the nationality of the victims. 20 civilians and six militants killed in Dhaka cafe siege, say Bangladeshi Army officials. The dead include foreigners. "It was an extremely heinous act. What kind of Muslims are these people? They don`t have any religion," the Bangladesh PM says in a televised speech. "People must resist these terrorists. My government is determined to root out terrorism and militancy from Bangladesh." Bangladesh is determined to fight terror, says PM Sheikh Hasina. She further hails all security agencies for their prompt response to the hijack situation. Bangladeshi PM Sheikh Hasina confirms that 13 hostages have been rescued. In a television broadcast, Hasina adds six gunmen have also been killed and one has been captured alive in a dawn raid on the cafe by Bangladeshi commandos. Bangladeshi Prime Minister Sheikh Hasina makes a statement on the attack. Tuhin Mohammad Masud said the cafe itself had been cleared but added that some of the hostage-takers might still be at large. There was no official word on the number of hostages who had been killed or wounded but Masud said that "obviously there have been casualties". Sri Lanka`s government said two of its nationals were among the hostages rescued and were safe and unharmed. India is closely monitoring the Bangladesh hostage crisis even as officials maintained that so far all Indian High Commission staffers in Dhaka were reportedly safe. Talking to Times Now, Tuhin Mohammad Masud, a commander of the elite Rapid Action Battalion which stormed the cafe, said 13 hostages have been rescued. "Three of them are foreigners and 10 locals." Bangladesh hostage crisis has ended after a commando operation. "The operation is over. The situation is completely under control," Army spokesman Colonel Rashidul Hasan told AFP. Meanwhile, Tuhin Mohammad Masud, a commander of the elite Rapid Action Battalion which stormed the cafe, told Times Now channel that there had been a number of casualties, including six hostage-takers. " India has, meanwhile, called for quick action to adopt the long-stalled Comprehensive Convention on International Terrorism (CCIT) and expressed disappointment that the United Nations General Assembly failed to push for its early adoption. It has been confirmed that anti-terror operation has ended. Security forces have launched a combing operation in the restaurant area. Amaq news agency, run by the Islamic State, said the militant group`s affiliates were responsible for an attack on a cafe in Bangladesh. A tweet from the news agency also said more than 20 people had been killed in the attack in Dhaka. Two big explosions heard inside Dhaka restaurant. According to Lt Col Tuhin Mohammad Masud, the commanding officer of Rapid Action Battalion, 13 hostages, apparently including Indian and Japanese nationals, have been rescued. The US has said it cannot yet confirm the Islamic State terror group's claim owning responsibility for the hostage crisis in a Dhaka restaurant. "We have seen ISIL (ISIS) claims of responsibility, but cannot yet confirm and are assessing the information available to us," State Department spokesman John Kirby said. According to CNN, senior US officials believe that the attack has been probably carried out by Al Qaeda in Indian Sub-continent, which was declared as a terrorist organisation by the US only a day earlier. Around 8-10 hostages have been rescued by commandos who were still inside the besieged restaurant. The number of gunmen and hostages still in the restaurant was not clear, Mizanur Rahman Bhuiyan, a deputy director at the Rapid Action Battalion force, told news agency Reuters. As per latest reports, five terrorists have been neutralised, one arrested, and two are unaccounted for. Presumptive Democratic nominee Hillary Clinton prayed for the safety of those taken hostage by terrorists in Dhaka and said people will never succumb to fear and hate. The Bangladeshi Army Chief is at the location, says local media. Unconfirmed report says at least 5 persons presumably hostages have been moved out via ambulances from the cafe. More ambulances are moving into Dhaka restaurant lane. Local reporters say at least 100 commandos surrounded cafe. Retaliatory fire was also reported. Several persons including one foreigner rescued from Dhaka restaurant, says Mizanur Rahman of RAB. They are being taken to hospital. Several persons including 1 foreigner rescued from #Dhaka restaurant says Mizanur Rahman of RAB. They are being taken to hospital. A witness who did not have direct access to the site of the attack in Dhaka tells CNN gunfire has stopped at the restaurant and there is an eerie silence. #GulshanAttack: At 8:15am, an ambulance of Rapid Action Battalion is seen to pass by carrying one injured. CNN reports more than 100 commandos are involved in the operation at the Dhaka restaurant. The Daily Star reports hearing loud noises of probable bomb blasts from inside the cafe. ANI reports say sniper fire can be heard from inside the restaurant. Bangladeshi media reports loud screams can be heard as the security forces' operation continues inside the Dhaka restaurant. An official confirmed that Bangladesh security forces including commandos have stormed the Dhaka restaurant where dozens of people including foreigners are being held hostage by suspected Islamist militants. "The operation has began. Commandos have stormed the restaurant," the official said. An AFP photographer at the scene said he could hear a massive gunfight as security forces launched the operation more than 10 hours after the hostages were taken. Meanwhile, reports say an al Qaeda affiliate has also claimed responsibility for the attack in Dhaka. The Daily Star is reporting that Bangladeshi joint forces have launched their offensive against the gunmen in Holey Artisan Bakery in Gulshan area of Dhaka's diplomatic zone. Even as the hostage situation in Dhaka unfolds, there are reports that unidentified assailants have attacked a Hindu priest in Satkhira with sharp weapons, leaving him severely injured. Islamic State posted photos on Saturday it claimed to be of foreigners killed in the attack on a cafe in Dhaka, where gunmen are holding hostages. Islamic State has claimed responsibility for the attack and said 24 people were killed. Bangladesh police have said two police officers were killed and at least 20 people wounded. If the pictures that are circulating on social media are genuine, then the number of casualties if going to be much higher than the current two. Reports of Japanese nationals among possible hostages in Dhaka restaurant attack. Italy`s Foreign Minister Paolo Gentiloni says he is closely following the situation in Dhaka, adding he is "anxious for the Italians involved". Italian Prime Minister Matteo Renzi is reported to have abruptly left a ceremony at the Colosseum in Rome on Friday evening to follow the hostage-taking incident, a source at his office said. 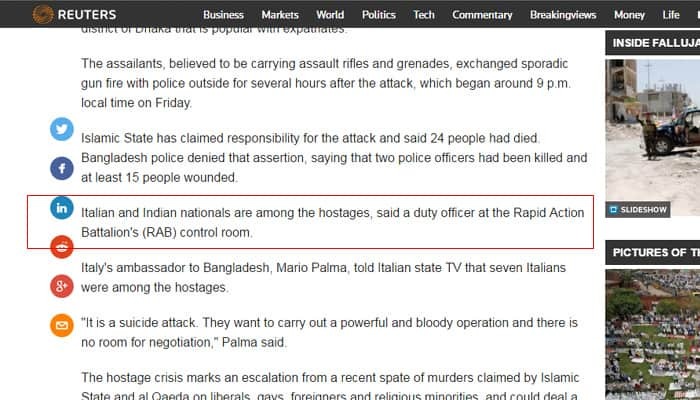 Italy`s ambassador to Bangladesh, Mario Palma, confirmed to Italian state TV that seven Italians were among the hostages. "It is a suicide attack. They want to carry out a powerful and bloody operation and there is no room for negotiation," Palma said. Gowher Rizvi, an adviser to Bangladesh Prime Minister Sheikh Hasina, told Reuters that the hostage crisis began when local security guards in the diplomatic enclave noticed several gunmen outside a medical center. An employee who escaped told local television that there were about 20 customers at the restaurant at the time, and most of them were foreigners. The restaurant has a seating capacity of around 25 people. There were also some 15 to 20 staff working there at the time, the employee said. Television footage showed a number of police being led away from the site with blood on their faces and clothes. Heavily armed officers could be seen milling on the street outside. A resident near the scene of the attack told Reuters he could hear sporadic gunfire nearly three hours after the attack began. "It is chaos out there. The streets are blocked. There are dozens of police commandos," said Tarique Mir. Reuters is reporting that Indian nationals are among those being held hostage at the upmarket Dhaka restaurant in the diplomatic zone. Reuters has quoted a duty officer at the Rapid Action Battalion`s (RAB) control room as making the claim. The Islamic State, which has claimed responsibility for the attack, said 24 people had died at the restaurant. However, Bangladesh police hav denied that assertion, saying that two police officers had been killed and at least 15 people wounded. Gowher Rizvi, an adviser to Bangladesh Prime Minister Sheikh Hasina, tells Reuters that security forces were trying to negotiate an end to the crisis, failing which they would launch an offensive to end the siege, possibly as soon as daybreak. 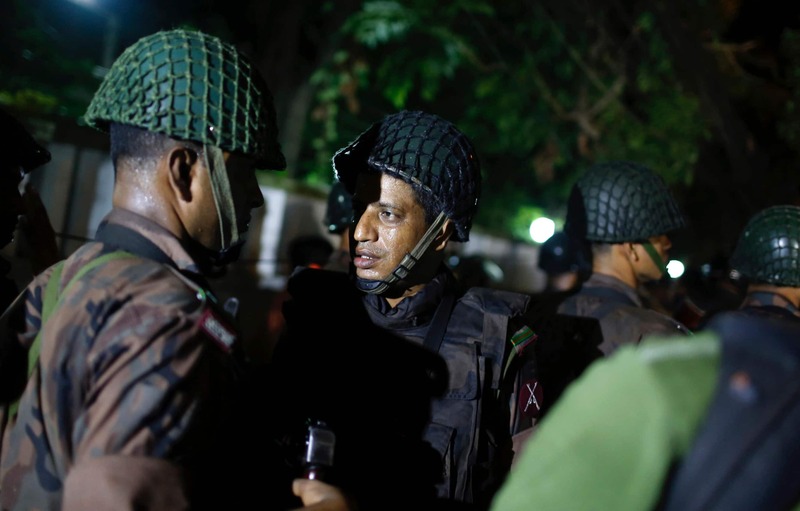 Reuters reports that the Bangladeshi police were preparing to launch an operation to free some 20 hostages, including several foreigners, from a restaurant in the capital Dhaka. Mizanur Rahman Bhuiyan of the Rapid Action Battalion added that police had not been able to communicate with the gunmen yet. Two Bangladeshis were able to escape from the restaurant with bullet injuries, he said. Seven Italian nationals are thought to be among the hostages taken by gunmen who stormed the Dhaka cafe popular with foreigners. Italian state TV RAI quoted the Italian ambassador in Dhaka, Mario Palma, as saying the seven Italians were businessmen. An Italian foreign ministry source said one Italian hostage had escaped. Italian media said the escaped man told police there were seven Italians still inside. The Daily Star reports cops as asking journalists and relatives of those stuck inside the cafe to move away further from the Holey Artisan for reason not clear. Could security forces be mulling to storm the restaurant? The US State Department says the IS link to the attack cannot be confirmed as yet.